Five men have been arrested after an attempted burglary went horribly wrong in Saratosa, Florida last Thursday. 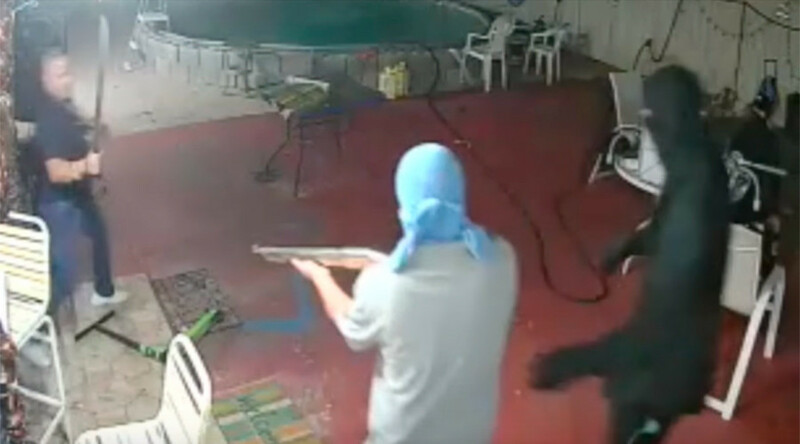 Police have released dramatic footage showing a homeowner with a machete face down intruders armed with a shotgun. Police received initial reports of a suspicious person with a firearm outside a home on Dodge Avenue, Saratosa at approximately 4:45am local time. While deputies were en route they received reports that not only had the homeowner fended off the attackers, armed with a shotgun, a machete and a crowbar, but he had also disarmed one of them while carrying out a citizen’s arrest. When police arrived on scene, the homeowner advised the deputies that the two other suspects had fled. Based on his description of the suspects’ vehicle, police quickly found and arrested the remaining would-be burglars. A total of five suspects were arrested and interviewed by Saratosa detectives, two of whom confessed to the crime. Investigating police later determined that two accomplices arrested in the vehicle had helped coordinate and plan the robbery. One suspect is charged with two counts of Armed Robbery and Possession of a Firearm by a Convicted Felon. Two of his accomplices are each charged with two counts of Armed Robbery. The remaining two suspects have been charged with two counts each of Principal to Armed Robbery.